(AFP) - France on Wednesday announced it would invite architects from around the world to submit designs for replacing the spire of Notre-Dame cathedral after a devastating blaze, as the government braced for a mammoth restoration challenge. 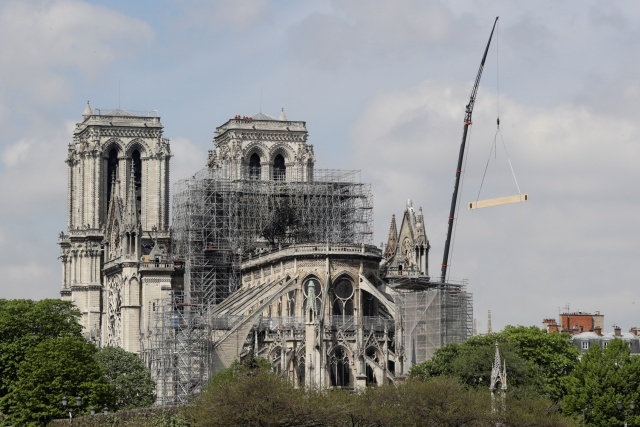 A descendant of the 19th-century architect Eugene Viollet-le-Duc, Jean-Marie Henriquet, 76, told AFP it would be a "great shame" not to rebuild the spire, adding this would equate to "amputating an element that belonged to it". The bells of French cathedrals rung out at 1650 GMT on Wednesday to mark the exact moment when the fire started on Monday. Disney, which scored millions with the 1996 animated blockbuster "The Hunchback of Notre Dame" based on the Victor Hugo novel, said it would give $5 million. US President Donald Trump, who was ridiculed by the French fire services after urging the use of water bombers to put out the fire at the fragile edifice, also pitched in with an offer of help. Trump said he spoke to Pope Francis and offered "the help of our great experts on renovation and construction" to rebuild Notre-Dame.